You have reached the (very meager) home page of Jeremy Howard, Founder and CEO of Enlitic, faculty member at Singularity University, and past president of Kaggle. I founded FastMail.FM (sold to Opera in May 2010), and co-founded The Optimal Decisions Group (sold to ChoicePoint in Feb 2008). You can find me on Twitter. CNN interviewed me and some of my team, covering Enlitic's breakthrough in cancer screening using deep learning to analyze lung CT scans. Wired provided an early look at Enlitic back when it first started, in the article The Data Scientist on a Quest to Turn Computers Into Doctors, and they also covered my role at Kaggle a number of times, calling me The Accidental Scientist . They discussed my views on the tendency of Silicon Valley to become something of an echo chamber. USA Today ran a piece about Kaggle entitled Startup makes competition of data mining , which included a fun pic of me at NASA Ames in front of the famous hanger. O'Reilly Radar and Forbes both published my paper Designing great data products ; O'Reilly also included my 45 minute talk from Strata which summarises the key points of the paper. The acquisition of FastMail.FM by Opera received a fair bit of media coverage, such as this ITWire piece (which apparently has decided I'm a "wunderkind", depite not being a kid, and not very wonderful either...), and this ZDNet article. It was also discussed on Slashdot. Email Service Guide had an interesting interview with me, which got discussed on Slashdot. Charles Wright talks about his experience in migrating his own domain to FastMail.FM. "...recently we've fallen in love with a Web-based e-mail system called Fastmail.FM, a beautifully fast and flexible service that uses a modern mail protocol called IMAP"
PC World compared the world's top web-based email systems, and ranked FastMail.FM equal top (with GMail - both scored 4.5 out of 5). They said "If you take your e-mail seriously, FastMail is the service for you"
A nice short overview of what FastMail.FM offers. "Web-based e-mail is not news but a service that allows Webmail, POP3, and IMAP on multiple providers to coexist, and provides a single point of integration at a low cost (a kicker) is news." 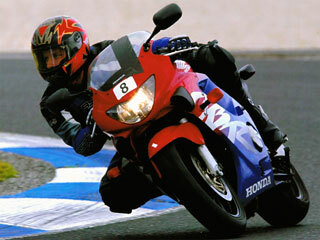 FastMail.FM gets a brief mention as a good way to get your email when on the road. "It's cheap, it's easy to use and it gets the job done." A brief history of FastMail.FM - the first article about the service. "For Howard, the success of FastMail has produced a satisfying irony. As an increasing number of companies move their e-mail systems over to FastMail, some of the people with whom he argued for years to give him a good corporate mail service, are now his customers." 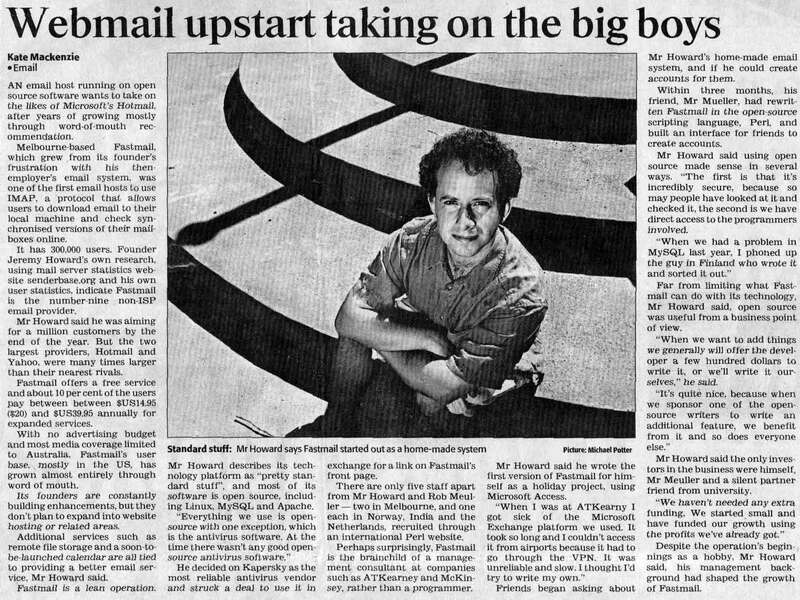 The Australian: Email upstart taking on the big boys. Also available with picture of Jeremy looking rather thoughtful. Looks at how FastMail.FM has grown into one of the world's top 10 email providers. " With no advertising budget and most media coverage limited to Australia, Fastmail's user base, mostly in the US, has grown almost entirely through word of mouth." The Star (Malaysia): Free email, anyone? 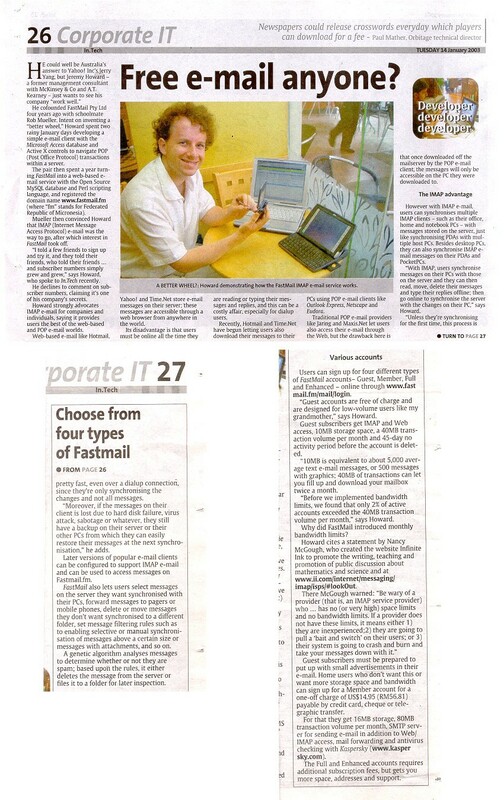 A longer article covering some FastMail.FM history, the benefits of IMAP, even a photo of Jeremy with some of his favourite gadgets! "He could well be Australia's answer to Yahoo! Inc's Jerry Yang..."
Julio Ojeda-Zapata describes how he got his own domain through FastMail.FM (see the bottom section for a nice review of FastMail.FM). "...a bargain for e-mail power users... The firm has existed since 1999, it's reportedly profitable and it's lately gaining a bit of buzz among tech-savvy Netizens. If that weren't reassuring enough, I talked with founder Jeremy Howard and came away impressed -- he knows his stuff." Discusses how to migrate from Hotmail to FastMail.FM, now that Hotmail has started charging to WebDAV access (which allows access through Outlook and Outlook Express). A short description of Jeremy's approach to filing email. Nothing about FastMail.FM here, but it does include a photo of Jeremy rollerblading! Talks about Jeremy's "executive gadgets", and includes a photo of Jeremy with his DataHand keyboard. Jeremy has contributed to a number of open source projects, particularly the Perl programming language, Cyrus IMAP server, and Postfix SMTP server. He has been active in the development of the Perl language, as chair of the Perl6-data working group, and author of numerous RFCs.